When installing wood floors, homeowners and contractors must be attentive to measuring the moisture content (MC) of the flooring prior to installation. Sounds simple enough. However, hybrid building materials increasingly mix multiple wood types together in modern flooring products. Engineered wood flooring uses the selected wood type on the lamella top layer surface; layers beneath can contain other wood types, such as medium or high-density fiberboard or plywood. In purely cosmetic considerations, mixing wood species and grains can result in beautiful patterns, colors, and textures for dynamic results. However, whether in assembly or in installation, it is critical to keep this thought in mind: Each type of wood has its own MC. Water vapor, known as moisture, is a structural component of every wood cell. As the relative humidity (RH) of the surrounding air rises, wood absorbs moisture and expands. When the RH falls, wood shrinks as it emits moisture back into the air. 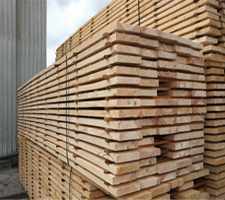 Lumber producers kiln dry wood to specific MC target levels depending upon the end product’s service requirements, which is known as its equilibrium moisture content (EMC) prior to delivering wood to the market. The EMC is the point of balance where the wood neither gains nor loses moisture, as it is in balance with the RH of its surrounding environment. However, moisture levels will continue to fluctuate as wood organically interacts with its changing surrounding environmental RH conditions. After installing wood floors, homeowners can expect wood to expand and shrink to some degree as the RH fluctuates around it, especially with seasonal changes or the presence of heating, ventilation and air-conditioning (HVAC) systems. Builders and consumers use moisture meters for wood to measure and manage the MC of wood over time. Before installing wood floors, informed contractors use a wood moisture meter to ensure that hardwood flooring moisture levels have balanced with the RH of the building environment, and continue to ensure that the MC is within product specifications during installation. Once floor installation is complete, hardwood flooring owners should still periodically monitor the flooring’s MC with a hand-held wood moisture meter as the RH changes with seasons or with the weather. The industry is diversifying its use of mixed wood products, and the durability and beauty that it allows also come with a caution. Put simply, some types of wood panels and wood flooring may contain more than one type of wood, each with its own MC. 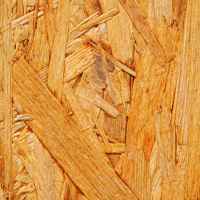 Oriented Strand Board (OSB) debuted in 1978 as an outgrowth of wafer board. It is an engineered wood panel product composed of wood strands, wafers, and flakes sliced from small diameter round wood logs and bonded with exterior binders under heat and pressure. OSB panels consist of layered mats, whose strands are strategically-placed for performance purposes. The surface layers have strands aligned in the long panel direction and inner layers have randomly-aligned strands. The large mats are then subjected to extreme heat and pressure and become master panels, which is then cut to size. This process produces a performance-based structural wood panel. Hardwood flooring installers may use engineered wood flooring atop a subfloor containing OSB. Engineered wood floors, by definition, usually adhere selected wood species on top with underside layers of less expensive species for support and durability. The manufacturing process typically ensures that these products are fairly stable, but when the MC has not been monitored, the problems are multiplied by the number of different wood species being used in the end product. Consider: if flooring manufactured with one wood species naturally shrinks or expands at one rate, the same floor manufactured with mixed wood species can shrink and expand differently according to each wood species shrinkage value. Measuring engineered wood flooring manufactured with different wood species and wood composites makes MC measurement even trickier than it has ever been. Luckily, Wagner Meters produces a variety of moisture meters for wood for every situation. The Orion® 930 Dual Depth Moisture Meter measures the MC from 1/4″ depth to 3/4″ making it extremely versatile. While the Orion 950 incorporates a temperature and humidity sensor to monitor the surrounding conditions of the wood being measured as well! With all Orion meters, there is an included On-Demand Calibrator and adjustable specific gravity settings so that each wood species type can successfully and accurately be measured for its MC. When installing wood floors or restoring old ones, stakeholders can use Wagner Meters to discover when it is safe to add another coat of finish to finely sanded wood flooring. 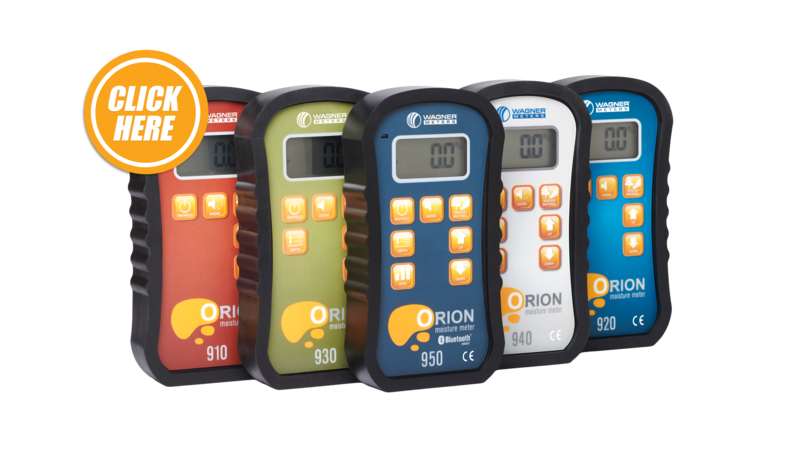 Even building inspectors can use the Orion family of moisture meters to reveal the general presence of moisture within numerous building materials used in building construction. Put simply, Wagner Meters manufactures industry-leading meters for any wood moisture measuring needs! Wagner Meters prides itself on non-invasive moisture meter products. Pinless moisture meters leave no residual punctures in surfaces, and Wagner Meters’ moisture meters feature state-of-the-art technology to read beneath all surfaces. Given the complexity of the new wood flooring products and designs available on the market, stakeholders are wise to invest in Wagner Meters. What Do These Moisture Meter Readings Mean?